Saturday, January 10, 1914: Got my first sleigh ride of the season last night. Most forgot what I did today. 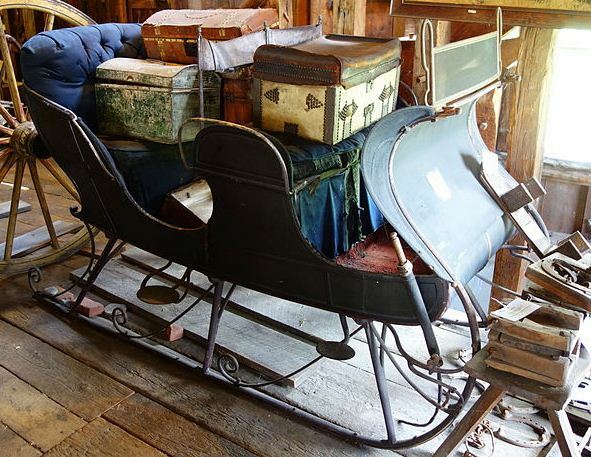 Wow, a sleigh ride! . . . Was it after the dance that you wrote about yesterday? . . .By the way, how was the dance? Was it a moonlit night? Was the sleigh ride cold? Were there lots of blankets in the sleigh to keep you warm? Posted on January 10, 2014 January 9, 2014 by SherylPosted in OtherTagged family history, genealogy. Previous Previous post: Going to a Dance! I have a feeling we can guess why Grandam can’t remember anything but the sleigh ride! I hope my Miss Muffly did have a “snuggle up” under the blankies with a rather sweet guy, Sheryl 😆 I can say that because she’s not my Grandma. Living in hot, dry South Australia … I can only imagine the magic of a sleigh ride. Goodness, but Grandma sure held her cards close to her chest, didn’t she??? Having been on three sleigh rides (with my hubby to snuggle up to), I can attest to how wonderful and romantic they are!! Was she afraid her sister got hold of her diary that she is keeping all the interesting details to herself? I hope she was riding in a pretty sleigh like the one in the picture! How wonderful that sleigh ride must have been for it to eclipse all her other memories of that day! She’s not my grandma! How was the dance Helena, did you meet a cute boy and snuggle with him on the sleigh ride???? And I love the boxes stored in the sleigh. I’m old enough to remember the pretty hat boxes for the big hats my sister and I wore. A sleigh ride! That’s something I’ve never done but would love to have the opportunity some day. A cousin raised Clydesdales. One year after our family Christmas party, several of us were wondering what to do for fun. We called him up to ask about a sleigh ride. He had a BIG sled that must have seated 8 or more of us. He pulled us around a pasture covered in snow. It was cold, windy, snow in the face, and memorable. Great questions . . . and I love the pic! Your inappropriate question made me laugh out loud! I think Flora Poste might be right–Helena knew Ruthie was taking peeks at the diary! This is a wonderful read! I’ve never been on a sleigh ride but we were on a few wagon rides in Europe and it’s so pretty going down country roads with the bells and horses.